HomingGame’s Kong fishing game is a latest complete 3D graphic arcade. We use the facial recognition technology. It is the same technology for "Rise of the planet of the Apes" if you have watched the movie. All the graphics appearance looks real !!! 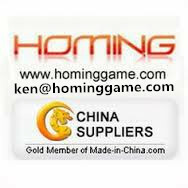 HomingGame is a leading manufacturer specializing in game and amusement equipment. We supply quality products at the most favorable price: Arcade games; Redemption games; Vending games; Indoor/outdoor amusement rides. Our products feature a low failure rate and needs very little maintenance as we always choose to prioritize and place quality ahead, which helps you maximize profits instead of wasting your time and energy in dealing with quality problems. Plus all our products come with warranty and technical support. HomingGame adheres to the business philosophy "working with our partners to achieve mutual benefits". Please don't hesitate to contact us if you need anything or any information, and your needs will be met with the utmost customer care and service.